The album begins with the title track, a thunderous and extremely catchy pop rocker with bold lyrics that tells us who they are and their philosophy. 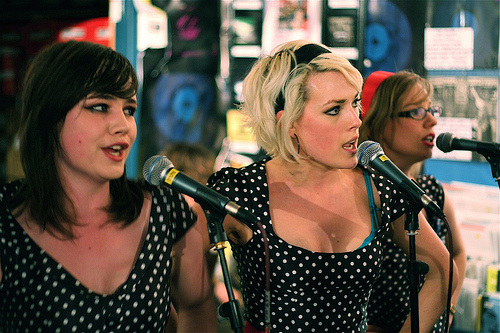 (“We are The Pipettes, and we've got no regrets / If you haven't noticed yet, we're the prettiest girls you've ever met.”) I'm sure if I ever actually met them, those words would be no lie! Compositionally, it's not a terribly complicated song, but it's memorable and and it has a lot of attitude. That was the perfect way to open the album. What comes next is my personal favorite “Pull Shapes” with a melody that's so catchy and memorable that I have no doubts that could have become a hit in its own right back in the day. The confidence in their vocal performances are engaging all throughout this album, but in that song in particular. You can expect more immaculate melodies and solid vocal performances in “Judy,” “Tell Me What You Want” and “I Love You,” the stellar album closer. The benefit of creating an album full of songs styled after Phil Spector is that it's automatically going to be fun to listen to. Even if the melodies aren't always consistently catchy, all of these songs are still upbeat and these girls can always muster enough spirit to cook up a storm. Unfortunately, the downfall of an album like this is it only has one trick. After enjoying the snot out of the first couple songs—basking myself in all that exciting early '60s energy—the novelty starts to wear pretty thin. Part of that has to do with the fact that some of these songs are better than others, but I confess to getting bored quickly with albums as non-diverse as this. 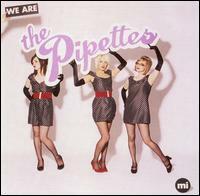 Believe me, I get similarly bored with actual '60s girl group albums, so I guess We Are the Pipettes are authentically retro in more ways than one. Songs like “Dirty Mind” and “A Winter's Sky” are composed and arranged well, but they don't seem to be quite as melodically radiant as the other songs. It's impossible to describe *what* makes certain pop songs seem to stand out more than others, but you can immediately tell a great one when you hear it. Roughly half of these songs have that sparkle, which is actually quite a substantial number for a pop album. Interestingly, this band has gone through pretty heavy line-up changes through its inception. That's pretty strange, especially for a band that's just started out, but it's not unheard of in good old rock 'n' roll. Two of the band members who recorded this album have left. The only one that is left, Gwenno, was a replacement herself to someone who later started the band The Indellicates. (The exception is the back-up instrumentalists, which have remained fairly static so far.) I assume they'll continue to release albums under The Pipettes' names. After all, I don't think they have quite the name power to just tour around the world performing these songs. I certainly understand why these girls wouldn't have wanted to stick with the group for so long. This niche they found for themselves is a pretty limiting one. A cute idea, certainly, but nothing a serious and ambitious young musician would want to do for too long. Based on how well these songs are written and how fun it is to hear them performed, you can bet these girls are capable of other things. 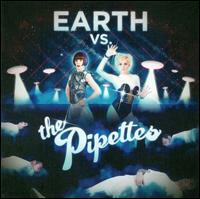 Apparently, it was important that I reviewed the UK release of We Are the Pipettes and not the US release. The American version is slightly different; it was remixed. I compared bits of both versions, not thinking I would particularly notice the difference, but I did notice something; the drums were quite a bit louder in the UK version. The loud drums seem to suit these songs better, particularly in the opening track and “Dirty Mind.” So, I am officially recommending that you hold out for the British release if you're interested in hearing this. Although if you can't find it, then it's probably not that vital. But, as I said, I like “Call Me” in all its disco glory. Anyone who wants to make a nice, modern dance mix and doesn't want to infest it with that obnoxious electronic crap done nowadays by most pop acts, then that's one you might want to consider for it. Granted, it still is electronic (it's got what I like to call calculator-synths). But far more of the concentration is on the boisterous and heavily layered female vocals, which are just as exciting as ever. Most importantly of all, the melody they're singing is infectious, so why would I bother crying foul? With that said, I can imagine that a huge fan would have felt betrayed by it considering it's nothing like the thunderous and larger-than-life way in which their debut album opened. It's just a good pop song and little more. But I do have a lot of fun with it. “Ain't No Talking” is also another good one, this time with a funky flavor that makes it sound more like a mid '70s Motown number. (Still disco!) And I also won't bother denying that the song is fun and infectious as hell. It's no “Pull Shapes” (which on further refection, should have gotten an A+ in my review), but I would be so pompous as to state that it was one of the top dance songs of 2010. Put a gun to my head, and I'll tell you that's my favorite song of this album. I'll say that tthe synth intro to “Need a Little Time” sounds too much like the iconic “Axle F” instrumental from Beverly Hills Cop that it's distracting, and the stiff and thumpy disco drumbeat is also pretty awful. Nonetheless, would I deny that my foot taps a bit when I hear it? “History” is similarly fun. I don't go out of that melody whistling its melody under my breath, but it makes a fitfully enjoyable listen. “Finding My Way” is the album's buried gem, coming in at Track #10. The vocals are quite strong, particularly the lead's who is reminiscent of the guttural and soulful vocal stylings Tina Turner. It also has a pretty darn solid hook in its chorus. I clearly like some of these songs more than others, but I'm nonetheless overall amused by most of them. I'll also go ahead and echo the sentiment that The Pipettes lost quite a bit of their charm abandoning their Phil-Spector-group past and embracing disco. With that said, I ended up giving both albums the same rating, but the debut still edges this one out. The reason this album still gets an overall positive score is, simply, it has a handful of good songs on it. Isn't that, in the end, what makes it all worthwhile? It didn't take long for Julia Clark-Lowes to leave The Pipettes. She didn't even stick around for them to release their first album! I understand why she would want to leave that group since they were kind of kitschy, but why not at least stick around for the music videos and the glory? Women! I'll never understand them! 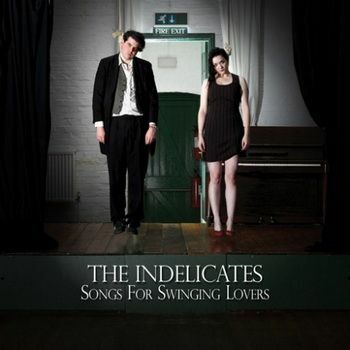 But anyway, here is The Indelicates, the band she started with Simon Clayton in 2005. So what of the first ex-Pipettes solo album? To be perfectly honest I'm not terribly impressed with it. It's an intelligent album with a fair number of entertaining moments, but it also has nothing that really digs into me. I've been into making iPod playlists in recent months, and I can't say I would put anything from this album on a playlist. The closest thing it has is perhaps “The Last Significant Statement to Be Made in Rock 'N Roll” with its bubbly, Cars-like rhythm and catchy melody. It's quite a nice little toe-tapper, and it shows how wonderfully entertaining these guys can be, but I don't exactly get the burning desire to hear it more than once. I also like “Sixteen” for that poppy, bubblegum beat and those edgy guitars. If you only listen to two songs from American Demo, then make it those two. Unfortunately, if you listen to the entire album, it's starkly apparent that they weren't the strongest songwriters around. For every interesting piece like “The Last Significant Statement” and “Sixteen,” there is another one that comes across as rather stale. “Our Daughters Will Be Free” is a cute sort of new-wave throwback, but the melody is weak and I get tired of listening to it halfway through. “Better To Know” has a similarly nicely done instrumentation, but it's entirely forgettable. There are a number of other nice songs that I do enjoy, but I'm not too excited about. “Julia, We Don't Live in the '60s” is a fun upbeat pop-rocker that you can dance to. “America” has a marginally interesting melody and fun to listen to. “We Hate the Kids” starts out quietly but gradually builds up into something louder, convincingly giving me the impression that it's EPIC. Nicely done, I say! By the end of the album, I start to get a little wary of their strategy of tacking on rock 'n' roll sections at the end of their songs just to keep them from growing too boring. That strategy has been employed by plenty of artists and have worked magic (“Hey Jude,” anyone? ), but these ones aren't quite as successful. They don't initially hook me in strongly enough for me to want to carry on with it to its rock 'n' roll section, and so all that energy seemed a bit unnecessary. They do this in so many songs that I just get tired of it. That said, there's one instance where they did that pretty well in “Unity Mitford,” which features a pretty good melody! There are plenty of nice songs on American Demo for me to mildly recommend some of it to listeners who like this sort of music. I'm personally not too wild about it (this is a weak 11), since there aren't enough spots that grab my attention. I would just recommend that you check out some of the singles first and then go from there. You can't go too wrong with songs like “The Last Significant Statement to Be Made With Rock 'N Roll,” “Sixteen,” and “Unity Mitford.” See what you think. Also, it's been pointed out to me by a fan of this album that these guys write excellent lyrics, and I tend to agree with that. If you like lyrics more than I do, then I invite you to check out these lyrics for yourself at this website: http://lyrics.wikia.com/The_Indelicates. 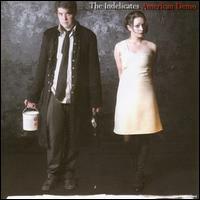 The Indelicates' debut was American Demo, which was an album full of pop-rock numbers—sometimes with a bit of a glammy edge. For their sophomore release, they're giving us a show-tune-laden concept album that explores what goes through the minds of teenagers and people in their early 20s. Here are the lyrics to the opening song, “Europe,” which is a piano-led cabaret-style song. (“I can write my name in my father's hand / I can see your souls, I can understand / I can dress myself, I can see you pass / I can lick my lips and I can slap your arse / And the waters laps at the harborside / And these hatreds are petrified / We can dress ourselves, we can see you pass / And these hatreds were built to last / So sit with me and we'll raise a glass / To Europe.”) ...I get the sneaking suspicion, there, that they were throwing together bits of imagery and hoping that they would be interpreted it as poetry. For sure, it's more convincing than that infamous YouTube video “Chocolate Rain,” but I'm still not completely buying it. ...Eh, what am I saying? I know nothing about poetry! And—my gosh—is this album ever melodramatic. It makes me think they were trying to write a Gilbert and Sullivan opera for the 21st Century, or something. And by 21st century, they use electric guitars, drum-beats, and have an indie-rock frame of reference. The melodramatics in this album go awfully over-the-top throughout this, but I suppose I can't criticize it too much for that since it's about teenagers, after all. I mean, I was a teenager once, and I remember what it was like thinking my world was always on the brink of destruction. Maybe I even like over-dramatic music? I can appreciate Jacques Brel, for instance, and try as they might, they'll never sound more deathly serious as that guy. However, as I was listening to this album, I couldn't shake the impression that Simon Clayton was using this as an auditioning piece for the title role in The Phantom of the Opera. He has an OK voice for it, but it eventually started to irritate me. Couldn't he sing some of this in a more straightforward manner? Julia Clark-Lowes, on the other hand, has a very pleasant high-pitched coo, and she only hammed it out once in the album—for “Europe.” And well? She did a pretty excellent job belting that one out! But I think I could listen to her singing voice in the other songs all day—I particularly like the way she sings throughout that morose piano ballad, “Roses.” For sure, that's not a perfect song; like almost everything here, it's orchestrated nicely and has a hooky melody, but it never completely catches fire. However, it's a pleasant thing to sit through. Clark-Lowes' more straightforward vocals even sound nice during the upbeat show-tune, “Flesh.” That's also a good place to hear the the contrast between her and Clayton, who hams it up considerably in the background repeating the song's title over and over again. (Here's what he sounds like to me: “Fleeeeeeeeeeeessshhhhh... ohhhh Fllleeeshhhh... oooh FlllEEEEEssshhhh....”) They close the album with what's the most melodramatic song of them all: “Anthem for Doomed Youth.” ...Doesn't that title alone show you that they were taking this concept pretty seriously? I mean, they wrote a freaking anthem! Whoah! Perhaps they could have done more with diversity since I'd say there is too much reliance on piano-led show-tunes. With that said, they did include an upbeat country-western number on here called “Sympathy For the Devil.” (Not a Rolling Stones cover!!!) “Be Afraid of Your Parents” is a swaggering tango, which is still a show-tune, but at least it's a different kind of show-tune.